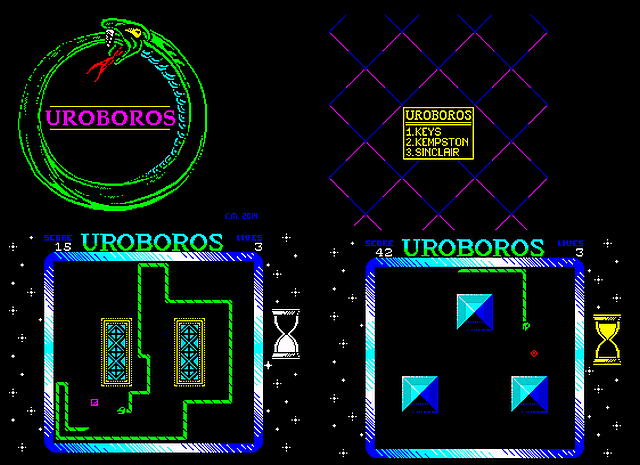 Uroboros developed by Ralf, is a recent ZX Spectrum game competition entry in Poland that takes the original Snake game concept and adds a number of interesting ideas that really makes for a great homebrew release. Rather than the usual snake game play of just eating and growing, Uroboros adds a new twist of grabbing your tail to complete the level after you have attained a high enough score. Furthermore each level has a number of obstacles and a border that hinders your score ranking. A rather nice game to have on your ZX Spectrum, that also features "borrowed" music from a huge collection of Russian music modules. The controls are Keyboard,Kempston or Sinclair.The keys are standard -QAOP Space.